A little while ago I was contacted by Brigitte Heitland of Zen Chic inviting me to play with her latest collection, Reel Time for Moda fabrics. I was so honored because I have been a fan of Brigitte’s for a long time. 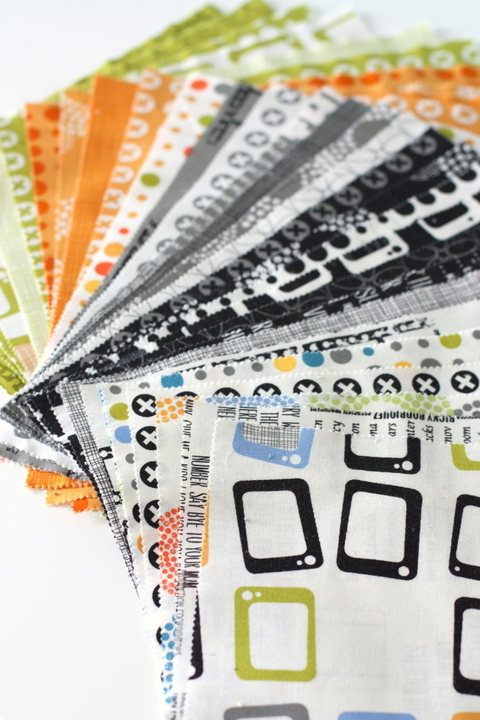 The first time I was introduced to Zen Chic was at quilt Market in Salt Lake City about 5 years ago. I LOVED her modern and minimalist style and have enjoyed watching all that she has done since. Reel Time is inspired by old time cinema rolls and TV screens with lots of great black, white, and gray prints as well as some contrasting oranges and lime-y greens. It’s a fun, modern color palette with lots of great individual pieces – especially if you like neutrals and ‘low-volume’ prints. I had a Layer Cake (42 10″ x 10″ squares) to play with. I wanted to include everything and make something scrappy so I went with a traditional hour glass pattern. The fabrics and colors do all the work to take this traditional quilt design and give it a modern look. I’m excited to get some yardage and finish this quilt. I have a finished Hour Glass pattern in this design using 10″ squares in my shop (on sale!) that includes yardage requirements, borders, etc. Also an hour glass quilt blocks tutorial for a quick method to make this traditional block. I especially want to stash some of these great black and white prints – such great basics! I’m particularly smitten with the crosses in the circles. Brigitte has organized a bunch of other quilters who have also been playing with Reel Time. You can check them below out for more pretty inspiration. 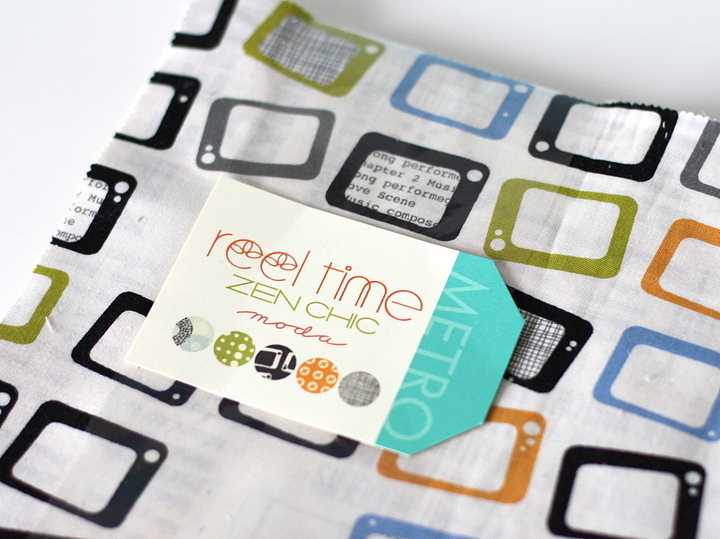 And be sure to stop by Brigitte’s Zen Chic blog at the end of the tour to enter to win Reel Time Fabric! Reel Time is arriving in stores and online. Precuts are available now from the Fat Quarter Shop, and Green Fairy Quilts. Gorgeous quilt! Those fabrics are going on my wish list! I was toying with the idea of making a pinwheel quilt recently! This pretty quilt has just reinforced how lovely a pattern it is! The orange and green combination is very fresh too! Wow. I’m not really an orange person, but Zen Chic always makes colors I wouldn’t normally use work in their lines. I’m smitten! Lovely quilt Amy! Can’t wait to see it with borders and all quilted up. This is really beautiful, Amy. I wouldn’t have picked this palette, but I really love it now. You always do a wonderful job combining colors and prints. Just nominated Amy for National Quilters Circle in the category of “Best Quilting Blog of the Year”, mainly because she is! Talented, funny and always upbeat, the information and inspiration in her blog makes my day. Thank you Amy for all that you do for our passion and love of quilting! Aww thank you DeDe! Your kind words mean a lot. You made my day! It’s so cute! I just love all her fabrics too. I made a little quilt last week using this line. You are right about stashing some of the lighter prints. When it comes into our shop, I plan on hoarding! Have you heard about her new line coming called Ink? I haven’t! I’m going to have to look it up. I always love everything Brigitte does. THANKS AMY! LOVE THIS QUILT! THANKS FOR SHARING ON THIS TOUR! I like how the orange and green work so well together with the black. This came out super! Reminiscent of Comma…just love the combination of colors and black and white! Looks great in your Hourglass top!!!! This line is fun! I love all of your hourglass quilts! I have been following this hop all week and your quilt with this fabric collection is AWESOME!!!!! I love, love, love it!! I hope you don’t mind that I pinned it because I will make one exactly like it!! Thank you for inspiring me!! What a fabulous choice of pattern to show off these lovely fabrics. Thank you Barbara! It’s a fun one and seems to work well with almost any fabric combination! I have to order my fabric online so it is difficult to match color. Can you tell me which of the Moda white/tan neutrals is a good match for Reel Time? I would use the Bella Solids 9900 97 Bleached White – it’s a little bit warmer, creamier white. I’m not as familiar with the tans, so not as much help there.